Jalapenos: cut off top and remove seeds and capsaicin vein, use apple corer to remove stems & vein of jalapeno. stuff with stuffing, if desired wrap bacon around top and secure with toothpick. Place jalapenos in a Chile Grill (made for jalapenos). Place on grill with aluminum foil underneath the Chile Grill, use low to med heat for about 30 minutes. Check often to make sure bottom of peppers are not burning. 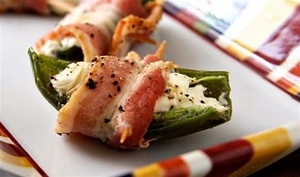 Makes 12 to 18 stuffed jalapenos.